James Powditch describes this self-portrait as being ‘honest and raw, about aging and facing up to the reality of who I am as opposed to what I project’. 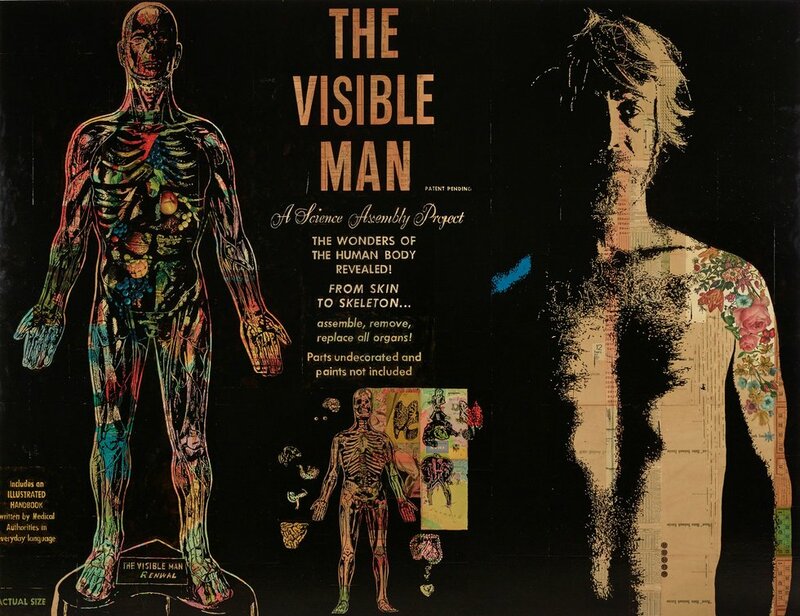 The Visible Man is an anatomy kit that Powditch remembers from childhood. Behind the figure are references to his youthful fascinations: movie stars, maps of exotic places, pictures from old art books. ‘Things behind the portrait of me include flowers – rose (love), daffodil (narcissism), St John’s wort (depression) – and chapter headings from The anatomy of melancholy , by Robert Burton, one of the earliest texts that looks at depression clinically and philosophically. There are also things that represent ways of creating order out of chaos: dates, calendars, statistics and astrological books,’ he says.